Baby cashmere is one kind of more luxury cashmere and we mainly undyed baby cashmere yarn in 2018/2019 FW season. Baby cashmere is the ultimate premium fiber derived from the kid cashmere goat. Prior to the animal reaching 12 months old, the softest and finest fibres which are found on the shoulder and flanks are collected humanely. 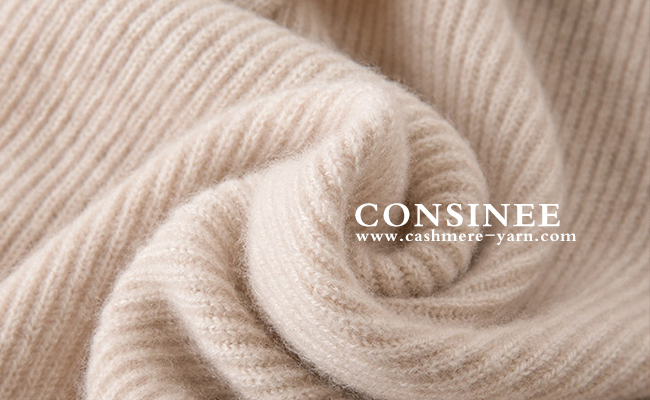 Besides normal 36 stock colors, Consinee promotes four Tibetan undyed colors baby cashmere on 2019AW which are DOLMA B051, PEMA B052, TASHI B053, and TENZIN B054. The natural and undyed hues of this yarn reflect the essential beauty, lustre and softness of this noble fibre. The complete absence of dyestuffs makes this uniquely gentile against the skin and kind on our environment. Baby cashmere fibre is rare in production amount. A single goat will only ever achieve a maximum of mere 30 grams of baby cashmere in its lifetime, that is why baby cashmere is so precious. The average micron of cashmere fiber is 13um to 14um and the length is from 34 to 36 mm. Baby cashmere is noticeably warmer and softer than even the best traditional cashmere. If you are interested in baby cashmere yarn and undyed baby cashmere yarn, pls contact me by email: afra.wang@consinee.com.cn or visit our website www.cashmere-yarn.com to learn more.